Ladies and Gentlemen - We here at A Liberal's Libretto apologize for the recent silence. But, we are finally and officially relocating back to the NYC and it took this week to get everything packed, loaded and on it's way. I know, you were losing sleep, weren't you? "... in a capital where every presidential inflection and turn of phrase is parsed for glimmers of meaning, that front-and-center display of enthusiasm for one of the “high” or “classic” arts boomed like a 21-gun salute. 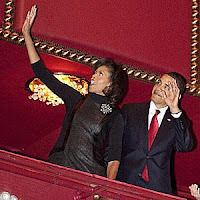 It fed increasing hopes among arts advocates that the Obamas would generate a greater buzz for the arts simply by smiling in theater seats or strolling through museum galleries."